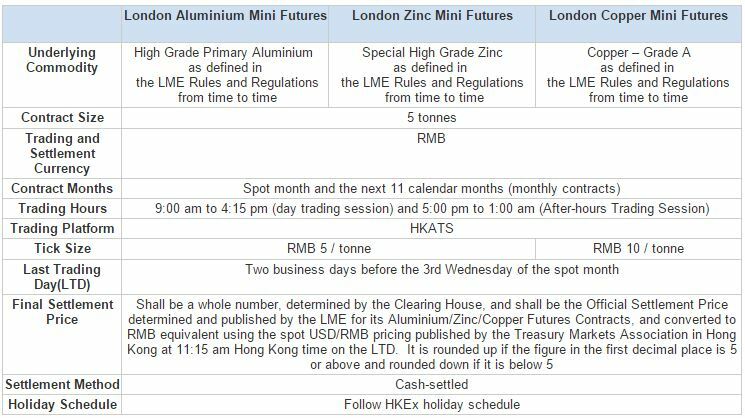 Hong Kong Exchanges and Clearing Limited (HKEx) has announced a forthcoming launch of new aluminium, zinc and copper futures contracts, available for trading on Hong Kong Futures Exchange Limited (HKFE) and cleared through HKFE Clearing Corporation Limited. The three mini metals contracts will be denominated in China’s national currency, the Renminbi (RMB), as of December 1st 2014, “subject to market readiness.” The decision to price the new futures contracts in RMB again underlines the currencies growing eminence and dominance in global financial markets. The US dollar’s hegemony is under threat. One of HKEx’s subsidiaries, the London Metals Exhange (LME), was recently appointed as new administrator for platinum and palladium benchmarking whilst being embroiled in several law suits involving aluminium and zinc warehousing in the US and the UK. “The new contracts will provide currency convenience, they will expand our range of RMB products, and they will further strengthen Hong Kong’s position as the leading offshore RMB centre,” said HKEx Chief Executive, Charles Li. All three of the new contracts are cash-settled monthly and trading hours will be 9:00am to 4:15pm and 5:00pm to 1:00am the next morning Hong Kong time Monday to Friday. With live trading due to begin in just over one month, HKEx is keen to avoid low liquidity conditions when the contracts begin trading. As part of its commercial strategy to increase volumes and liquidity, HKEx is launching two ‘Active Trader’ programmes with fee rebates to incentivise third parties as well as loosening conditions for LME members to become HKFE participants. HKEx plans to launch a dedicated US-dollar traded API 8 Thermal Coal Future contract in the near future.